The cathedral is dedicated to St Chad and Saint Mary. 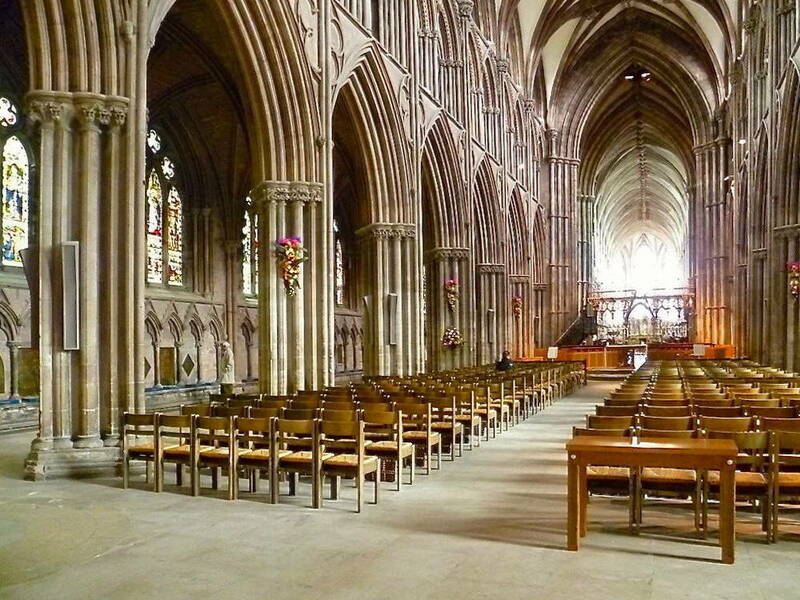 Its internal length is 113 metres (370 feet), and the breadth of the nave is 21m (68 feet). The central spire is 77m (252 feet) high and the western spires are about 58m (190 feet). 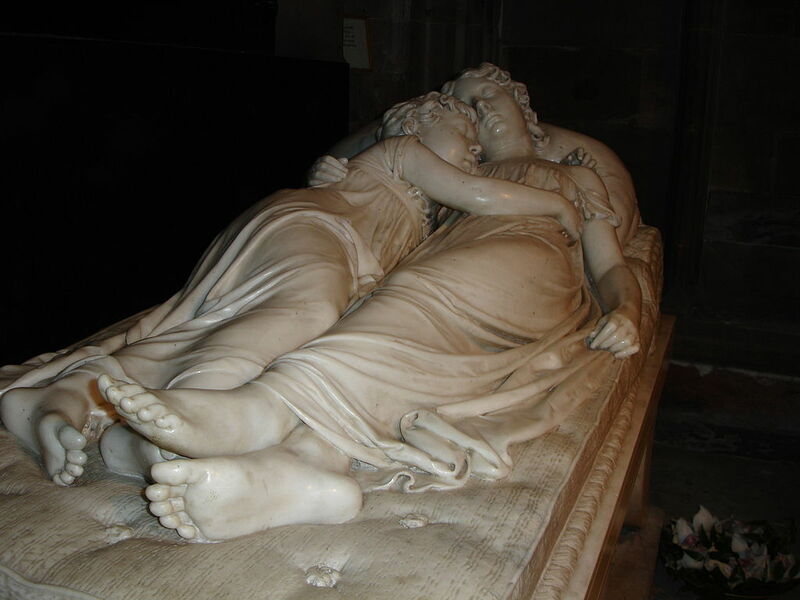 The stone is sandstone and came from a quarry on the south side of Lichfield. The walls of the nave lean outwards slightly, due to the weight of stone used in the ceiling vaulting; some 200–300 tons of which was removed during renovation work to prevent the walls leaning further. When Chad was made Bishop of Mercia in 669 he moved his See from Repton to Lichfield, possibly because this was already a holy site, as the scene of martyrdoms during the Roman period. The first cathedral to be built on the present site was in 700AD when Bishop Hedda built a new church to house the bones of St Chad which had become a sacred shrine to many pilgrims when he died in 672. Offa, King of Mercia seemed to resent his own bishops paying allegiance to the Archbishop of Canterbury in Kent who, whilst under Offa's control, was not of his own kingdom of Mercia. Offa therefore created his own archbishopric in Lichfield, who presided over all the bishops from the Humber to the Thames. All this began in 786, with the consent of Pope Adrian. The Pope’s official representatives were received warmly by Offa and were present at the Council of Chelsea (787), often called `the contentious synod', where it was proposed that the Archbishopric of Canterbury be restricted in order to make way for Offa's new archbishop. It was vehemently opposed, but Offa and the papal representatives defeated Archbishop Jaenbert, installing Higbert as the new Archbishop of Lichfield. Pope Adrian sent Higbert the pallium, denoting his support for this move. In gratitude, Offa promised to send an annual shipment of gold to the pope for alms and supplying the lights in St. Peter's church in Rome. However, The Archbishopric of Lichfield lasted for only 16 years, ending soon after Offa's death, when it was restored to Archbishop Aethelheard of Canterbury. 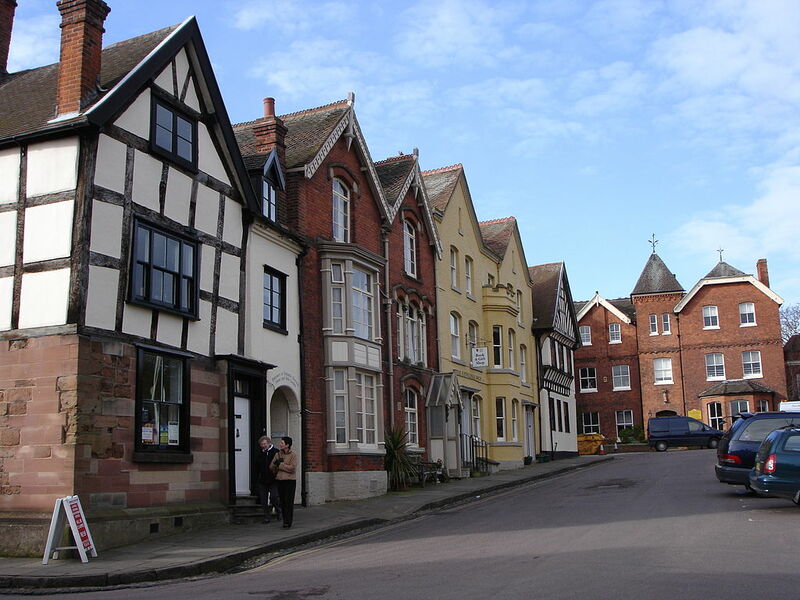 There were three great sieges of Lichfield during the period 1643–1646, as the cathedral close was surrounded by a ditch and defensive walls it made a natural fortress. The cathedral authorities with a certain following were for Charles I, but the townsfolk generally sided with Parliament, and this led to the fortification of the close in 1643. Robert Greville, 2nd Baron Brooke, led an assault against it, but was killed by a deflected bullet from John Dyott (known as 'dumb' because he was a deaf mute) who along with his brother Richard Dyott had taken up a position on the battlements of the central cathedral spire on 2 March 1643. Brooke's deputy John Gell, took over the siege. The Royalist garrison surrendered to Gell two days later. Although the 18th century was a golden age for the City of Lichfield, it was a period of decay for the cathedral. The 15th-century library, on the north side of the nave, was pulled down and the books moved to their present location above the Chapter House. Most of the statues on the west front were removed and the stonework covered with Roman cement. At the end of the century James Wyatt organised some major structural work, removing the High Altar to make one worship area of Choir and Lady Chapel and adding a massive stone screen at the entrance to the Choir. Francis Eginton painted the east window and was commissioned by the chapter to do other work in the cathedral. The ornate west front was extensively renovated in the Victorian era by George Gilbert Scott. 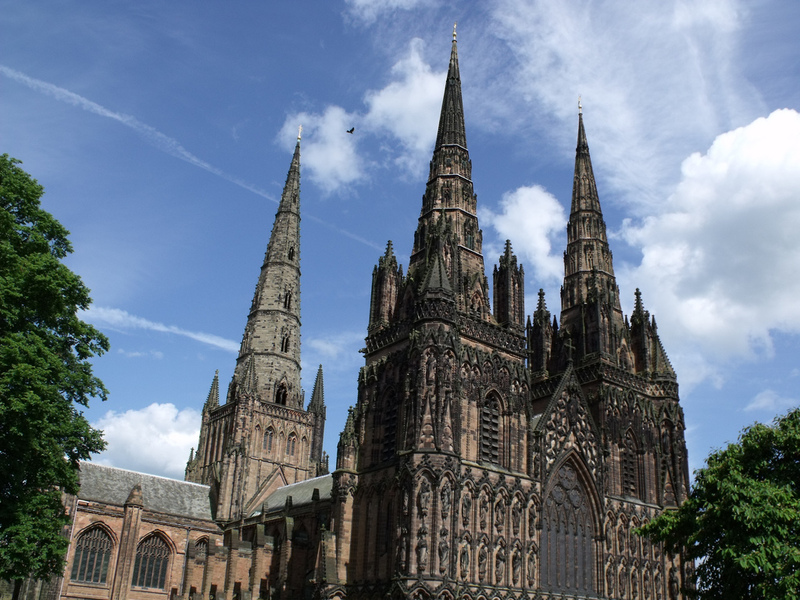 Lichfield Cathedral is a treasured landmark in the heart of the country. They would like to extend a warm welcome to all of their visitors! Here you can discover 1300 years of history in the only medieval three-spired Cathedral in the UK. See a medieval wall painting, the famous Herkenrode stained glass, the Lichfield Angel and much more. They are free to enter, however donations are encouraged. During your visit, they recommend you explore the Cathedral and its chapels, take a look at their treasures in the Chapter House, and enjoy a stroll around the picturesque close (one of the best preserved in the country!). Click here to download the Google Play app. Click here to download the Apple Store exploring app. If you're feeling peckish, they recommend you pay a visit to Chapters, The Café in The Close where you'll find freshly prepared snacks, meals and refreshments. Before you leave, don't miss the Shop at No.9, where you can pick up a unique gift for yourself or a loved one. Chapters, the Café in The Close, boasts a unique thirteenth century walled garden in an idyllic setting, as well as a delicious and varied menu. Visitors can enjoy locally sourced and freshly prepared dishes for breakfast, lunch and afternoon tea, seven days a week. Choose from cakes and pastries, sandwiches and paninis, soups, jacket potatoes, main courses and more. Gluten free diets are catered are, as are vegetarian and vegan. If you have any questions about the menu, please don't hesitate to get in touch before your visit. The Café is family friendly with high chairs and outdoor space available. You're also invited to sit out in the Tea Garden, a peaceful setting to enjoy good food and drink al fresco. From 30th September, 2018, Chapters will be offering Sunday lunches , 2 courses £12.50 3 courses £15.50. View their menu. Looking for something different? Have a browse in their shop and treat yourself or a loved one to something extra special. The shop has a fantastic range of handpicked items including books, stationery, prints, candles, locally produced products and more. They have a range of stylish and contemporary gifts for every occasion, including baptisms, weddings and birthdays. They also have a unique range of souvenirs for you to remember Lichfield Cathedral! The shop team are proud to support local artists and suppliers, stocking a beautiful range from artists working in Lichfield and Staffordshire. They are the number one destination in Staffordshire and the West Midlands for parish supplies, resources and stationery. You can purchase tickets for all Cathedral events at the Gift Shop, or buy online. All profits from the shop go towards Lichfield Cathedral to assist with its maintenance, mission and tradition for future generations. The Close surrounding the Cathedral has its own story to tell, with picturesque gardens, stunning buildings and a vibrant history. In medieval times, the close was a fortified area, with stone wall surrounding it on three sides, and the waters of Minister Pool acting as a natural barrier on the south side. Most of the buildings in The Close are owned by the Cathedral. Many of them were constructed in the middle ages, however some were altered in the 18th or 19th centuries, and their fronts hide the original structures. A visit to Vicars' Close will leave you feeling like you've stepped back in time as you take in the row of quintessential medieval houses. To the north side of the Cathedral there is a charming early 18th century Deanery and buildings which are now used by Lichfield Cathedral School. The late 17th century building which is now used by the school was, until the 20th century, the Bishop's Palace; this building replaced a great medieval palace. The Library, tucked away at the top of a spiral staircase, is one of the Cathedral's best-loved treasures. It is situated on the upper storey of the two-storey Chapter House, and is a home to a globally important collection of books and manuscripts. The Library has been housed in the upper room of the Chapter House since 1758. It houses a magnificent collection of treasures including fifteenth-century hand-copied manuscripts of Chaucer's Canterbury Tales, one of three surviving original copies of Christopher Saxton's maps of Tudor England, and a fascinating manuscript of illustrations issued by and signed by Charles I. History The library was built in 1249 and would have probably been the Treasury - spacious enough to house the Cathedral's plate and collection of manuscripts. Gradually augmented, this early library most likely contained both historical and theological works for use by the canons. In the late 15th century, Deans Heywode and Yotton gave money to build a new detached library on the north side of the Cathedral. This library was stripped of all its books and fittings during the Civil War. Refitted by Dean Smallwood for the reception of the Duchess of Somerset's bequest in 1673, it was then demolished in 1758. The Cathedral Library has occupied the space on the upper level of the Chapter House since that date. The current collection has been built up through generous gifts and loans. The Duchess of Somerset's bequest of 1,000 volumes from her late husband's library included manuscripts and early printed books. This bequest included the fine 15th century manuscripts of Chaucer's Canterbury Tales, Orders of Charles I for the regulation of the Prince's Household, and the 8th century St Chad Gospels* which the Duchess looked after during the civil war. *The St Chad Gospels are currently on display in the Chapter House, alongside the Lichfield Angel. Tours & Access. The library is used by scholars and researchers. They welcome private visits to the library, however access is by appointment only. They are thrilled to be able to offer a range of tours there at the Cathedral, giving you a wide range of opportunities to learn about this medieval building and it's history and heritage. Come and take a first glimpse into the vast history of the Cathedral and experience just the beginning of the unique and beautiful architecture and stained glass that make this building so special. These tours are conducted by their fully trained and extremely knowledgeable guides, and would provide a brilliant accompaniment to a day trip to the Cathedral. Tours are Free and run Monday – Saturday at 11.00 and 14.00. Highlights Tours last 45 minutes. Donations are encouraged at the end of any Highlight Tour. Please be aware that Highlights Tours are susceptible to other events in the Cathedral calendar so if you are planning a special visit to the Cathedral for a tour, please ensure that you double check the closures notices page beforehand, or call The Chapter Office on 01543 306100. Please note that group bookings cannot be taken for Highlights Tours. You can download their 2018 Group Tours brochure here. A tour of Lichfield Cathedral is a fascinating and enjoyable experience, whether you are booking a group visit for your club or company, or for something different to do with the family! Choose the ideal tour for your group, or combine two tours for a whole day's experience. Chapters, the Cafe in the Close, can cater for your group whether it be a tea/coffee on arrival, buffet lunch in a private function room or following your tour with afternoon tea. A general tour taking you on a journey through 1300 years of history where you can encounter stories of the Cathedral and learn more about the architectural features and monuments of this national treasure. As part of their 2018 programme of services and events to commemorate the centenary of the 1918 Armistice, a reflective and fascinating tour exploring monuments to the fallen and discovering the impact of war on the Cathedral over the centuries. This tour includes a minute's silence. Take a closer look at the fascinating and priceless Cathedral Treasures, including the Lichfield Angel, the Anglo-Saxon Gospels, and the beautiful collection of silverware. *Please note that as of 03/10/2018 both the Lichfield Angel and Anglo-Saxon Gospels will be on Loan at the British Library as part of the 'Anglo-Saxon Kingdoms: Art, Word, War exhibition. Both will be returning in February 2019. An atmospheric evening tour, when you will have the Cathedral exclusively for your group. Follow in the footsteps of medieval pilgrims and discover beautifully intricate craftsmanship, best seen when illuminated by candlelight. We end the tour in College Hall with conversation over a glass of warm punch. Minimum of 15 people required. An exciting chance to climb the central spire and enjoy magnificent views over the City and surrounding countryside, then walk among the medieval roof beams and discover hidden windows, passages and statues. Approx. 90 minutes - 2 hours. Minimum of 8 people required, Age 8 years and over only. •The Life of St Chad. To find out more and book your tour, please contact the Visitor Services team on visitorservices@lichfield-cathedral.org or call 01543 306150. Dedicated disabled parking for blue badge holders is available within the Cathedral Close at the West front of the Cathedral. A paved path on a slight incline runs from this parking area to the main entrance to the Cathedral at a distance of approximately 109 yards / 100 metres. There is a ramped access route into the Cathedral and once inside all areas are accessible, except for St Chad’s Head Chapel, which can only be accessed via a flight of steps. The Quire can be accessed by a ramp in the North Quire Aisle. Unfortunately, there is only one disabled toilet which is located outside the Cathedral in the Old Stables Courtyard on the South side of the Cathedral Close near to the Dam Street entrance into the Close. The accessible route from the Cathedral to this toilet is via the West End entrance. The distance between the West End Entrance of the Cathedral and the Disabled toilet is approximately 546 yards/ 500 metres. This is opened with a radar key and keys are available from Chapters, Reception or the Vergers. The Shop at No.9, the Cathedral Shop, is located opposite the West End Entrance of the Cathedral and there is level access via the signposted route that provides entry into the rear area of the shop. The distance between the Shop and the West End entrance of the Cathedral is approximately 328 yards/ 300 metres. Chapters, the Café in the Close is located on the South Side of the Cathedral Close and has ramped access. The distance from the West End Entrance of the Cathedral to the Café is approximately 437 yards/ 400 metres. There is reasonable level access in the Cathedral Close although there is a steeper gradient at the eastern end of the Close moving in a southerly direction. As the Cathedral and Close are historic areas, there are some uneven surfaces in places. Mobility scooters and manual wheelchairs are welcome within all areas of the Cathedral and Close. Assistance dogs are welcome in all areas of the Cathedral and Close and water is available on request. Deaf or hard of hearing access. The Cathedral is equipped with induction loops. Hearing aids should be switched to the T position. A dedicated audio tour of the Cathedral for the blind and partially sighted is available on request from the Shop at No 9. You can also find out more about The Diocesan Digest, the Sound Magazine for the Cathedral and Diocese. Assistance dogs are welcome in all areas of the Cathedral and Close and water is available on request. Transport: Lichfield City (National Rail) then 10 mins. Bus routes: 811, 822 and 825 stop close by. Opening Times : Mon. to Fri.: 09.30 - 18.15; Saturday: 09.00 - 18.15; Sunday: 12.00 - 17.00. Tickets : Free (donations welcomed). Group Tours : see above for details.